Mirmorax AS, provider of sampling and oil in water analyser solutions, has announced the launch of its Desktop Oil-in-Water Analyzer – the DT250. 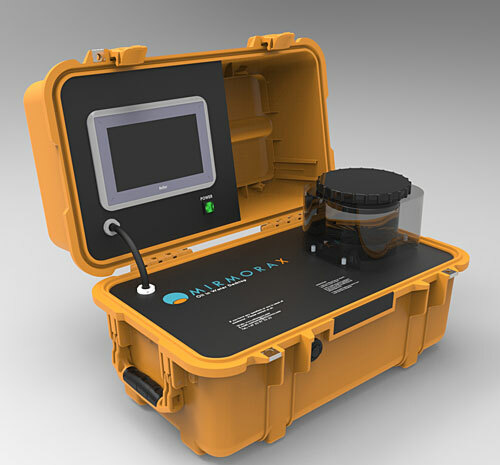 The portable instrument, based on Mirmorax’s third generation ultrasonic technology, provides efficient, flexible and highly accurate sample analysis as well as live measurements of oil and solids in produced water. For operators, this will lead to improved monitoring capabilities and the flexibility to de-bottle neck various parts of the processing system. This will bring new value and optimisation possibilities to existing separators and filters, enable targeted use of chemicals, and ensure the meeting of all environmental requirements. The Desktop Oil-in-Water Analyzer will also be particularly suited to challenging fields that host separation from different tie-backs with various oil types in the same produced water. Accurate and robust oil-in-water analysis with the ability to handle chemicals and various oil types. The new instrument simultaneously detects oil and solid particles; calculates the mean size of oil particles and solids; and provides other crucial input information, such as the temperature and salinity of process water. A low maintenance, robust and easy-to-use system that can be set up in minutes and either be used as a sample analyser or as a by-pass analyser providing continuous measurements. The instrument can analyse fresh produced water samples or samples that has been stored for a longer time. The instrument is lightweight, is ideal as a portable test instrument that can be mobilised quickly (fulfilling the weight and size requirements for offshore helicopter transportation) and comes in a robust, weatherproof case. The Mirmorax Oil-in-Water Analyzer is based on ultrasonic measurements in which individual acoustic echoes are characterised using advanced signal processing. A highly focused acoustic signal is transmitted directly into the produced water and the reflection and absorption of the signal provides a wide range of accurate measurements. The analyser is designed to manage the lower range (0-250 ppm) of oil and particles and delivers accurate classifications of particles and size distributions. The integrated design also includes a separate chamber where the sample is analysed with a stirrer keeping the sample homogeneous at all times. Analysis time for a sample is less than five minutes under normal conditions with the model also including an outlet interface that allows for by-pass flow of produced water to flow continuously through the measurement chamber. This is particularly useful when finding the optimal location for in-line probes. The instrument also comes with a produced water-sampling bottle that enables closed circuit sampling for optimal HSE and the conditioning of old samples for later analysis.